Germany v Sweden produced the most dramatic of endings with Toni Kroos scoring a stunner in the 95th minute to salvage Germany’s World Cup campaign. Joachim Löw heavily rotated the squad that started against Mexico. Mats Hummels missed the match with a bad back and Sami Khedira, Mesut Özil and Marvin Plattenhardt were dropped in favour of Sebastian Rudy, Marco Reus as well as Jonas Hector. The rotation was partly a reaction to the heavy criticism and the poor performance in the first match against Mexico. 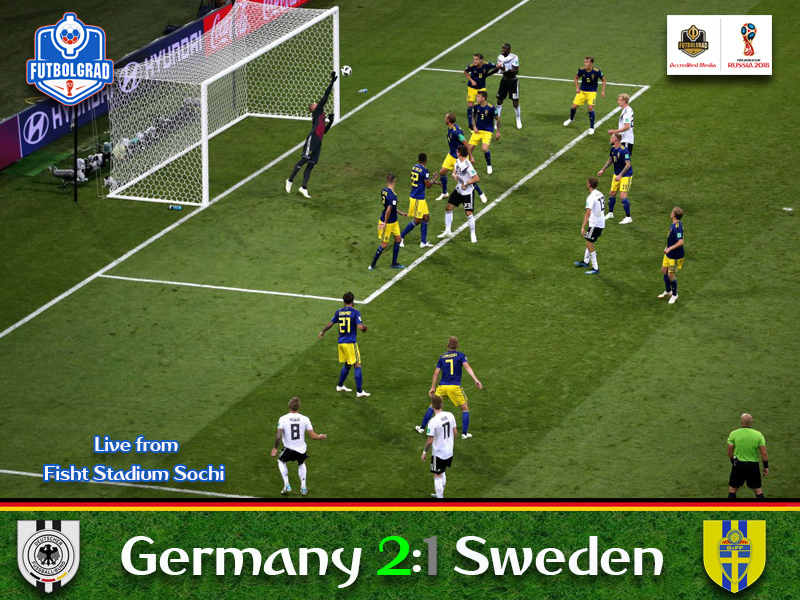 The changes seemed to have an immediate impact with Germany putting Sweden under pressure from the getgo. Timo Werner had the first breakthrough in the second minute, his pass to the centre was cleared at the last moment, and in the fourth minute, Jonas Hector had a shot blocked by a Swedish defender. Germany kept coming. In the eighth minute, Marco Reus found acres of space on the right and his hard pass into the six-yard box was just about cleared ahead of the waiting Werner. At this point, a German goal seemed only a matter of time, but with the score 0-0 and Sweden sitting deep there was always a danger that Sweden could hit the Germans on the counter. That moment seemed to have arrived in the 13th minute when Antonio Rüdiger played a poor ball in midfield that allowed Marcus Berg to break away and go one-on-one with Manuel Neuer. Jérôme Boateng had also rushed back and managed to interfere just enough for Neuer to clear the situation. The chance by the Swedes somewhat muted Germany’s Sturm-und-Drang phase. Die Mannschaft now played more conservatively trying to stretch Sweden’s defence by playing long-diagonal balls from one flank to the other. But the Swedish defence stood form as the match approached the second half of the first interval. Then Germany lost Sebastian Rudy in the 27th minute. The midfielder was hit in the face by a Swedish defender and had to be taken out of the match. In his stead, Ilkay Gündogan was brought on. Heavily booed against Saudi Arabia the midfielder was greeted with a few cheers by the German fans. Those very German fans would shortly after fall silent when Sweden took the lead in the 32nd minute. Once again it was a misplayed ball in midfield that led to Germany’s demise. Kroos’ pass was played into Berg’s feed, and the striker spotted his forward partner Ola Toivonen at the right edge of the box and his shot was deflected by Rüdiger leaving Neuer with no chance in the Germany goal. Germany were stunned for just a moment and then returned to their monotonous passing play around the Swedish penalty box. At this point, Die Mannschaft were too static and lacking the inspiration to break down Sweden. The Swedes in turned used the space that Germany left behind their defensive line to hit the Germans on the counter-attack and should have scored in the 44th once more when Emil Forsberg easily beat the offside trap, and only Jonas Hector’s last-minute interference stopped Viktor Claesson from scoring. Germany remained in the game but still had a steep mountain to climb. As a result, Joachim Löw reacted at halftime bringing on Mario Gomez for Julian Draxler. It was a change that gave Germany an extra attacking edge, and within one minute of the second half, Germany equalised after a low cross found Marco Reus, who with his first World Cup goal ever brought his country back into the match. Germany kept coming. In the 50th minute, Toni Kroos delivered a perfect free-kick into the box that was met by Thomas Müller but his header missed Robin Olsen’s goal by just inches. With Germany scoring the game all of a sudden came alive. The Germans were pressing and the Swedes, in turn, waiting for their opportunity to hit Die Mannschaft in the transition game. As a result, a happy back and forward developed 15 minutes into the second half. Slowly but surely Germany took control of the match, however. Setting themselves up deep inside the Swedish half they slowly but surely started tightening the noose around the neck of the Blågult. At this point 20 minutes were still to go. Enough time to salvage Germany’s World Cup dreams but the time was also running against die Mannschaft, who at this point were in desperate need of that spark that could turn around a World Cup campaign threatening to go sideways. With just ten minutes left Germany started their final offensive of the match and Werner appeared to have the equaliser in the 81st minute after a low cross found him wide open inside the penalty box. But the RB Leipzig forward’s zipped over the crossbar. Then in the 82nd minute, things went from bad to worse when Boateng was sent off with a second yellow card after a hard challenge against Berg. Germany needed a miracle, especially after Olson pulled off a fantastic stop on a close-range Mario Gomez header in the 86th minute and Julian Brandt had a shot hit the post in the 90th minute. Meanwhile, the Sweden fans started to celebrate as the world champion was on the brink of elimination. But in the 95th minute, Germany were given one last free-kick from an impossible angle and Reus and Kroos would pull out a trick that may turn events around for this team. 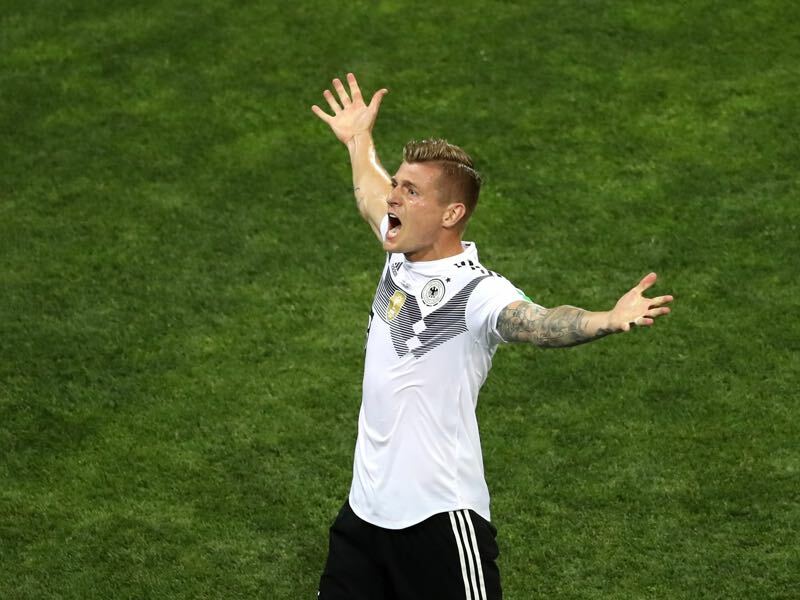 Kroos tapped the ball to Reus, who quickly stopped it to leave it for Kroos, who hammered the ball home to save the World Cup campaign. Hard not to pick Toni Kroos. The midfield maestro has always been the only player in the team that could not be replaced. The Real Madrid midfielder never lost his calm throughout the 90+5 minutes and when it mattered the most produced the goods to get Germany the result. Germany may have won the match but certain vulnerabilities remain. Once again, die Mannschaft were easily hit in the transition game. Furthermore, Germany were lacking efficiency when it came to capitalising on their chances. They may have avoided elimination today but other teams would have punished them more severely. Toni Kroos made 144 touches against Sweden tonight, a record for a German player in a World Cup game since 1966. 94:42 – Toni Kroos’ strike is the latest goal Germany have ever scored in a World Cup match (excluding extra-time). Boateng is the first German player to be sent off in a World Cup match since Miroslav Klose against Serbia in 2010.